Call it a coincidence, but Metal Gear creator Hideo Kojima tweeted this just one day before the release of Another World 20th Anniversary Edition on the 3DS eShop. Keep in mind Another World was called "Outer World" in Japan, and "Out of this World" in America until recently. I'm sure this message is meant to be taken literally, as in, "When can I play Another World on the PS4 or Xbox One?" But when this tweet popped up in my feed, my first interpretation was "When will this new generation of hardware see a game as fresh and revolutionary as Another World?" That's not me picking on Microsoft or Sony, mind you. Very few games of any generation come into being as untested and confident as Eric Chahi's labor of love—especially since it's become so much more difficult for a single production to be driven by the creative spirit of just one person. Chahi didn't craft Another World without some important cues, of course. Without Jordan Mechner's Karateka and Prince of Persia, it's doubtful Chahi's game would feature the same rotoscoped graphics that depict the world in the visual language of cinema and endow the thoroughly average (at athletics, anyway) protagonist with a relatable sense of humanity. Mechner's games fell back into a reliable set of platforming and fighting mechanics, but Chahi aspired to something greater. While Another World pads out its length with some standard action segments—which feel much more forgiving than their original execution—Lester as a character can do much more than run, jump, and shoot. In fact, Another World feels like Chahi adapting the then-popular point-and-click adventure format to the grammar of action games: In any given scene, Lester is tasked with solving environmental puzzles in different ways, though these interactions are almost always performed using the same basic controls. Welcome to Another World: Where everything wants to kill you in increasingly creative ways! 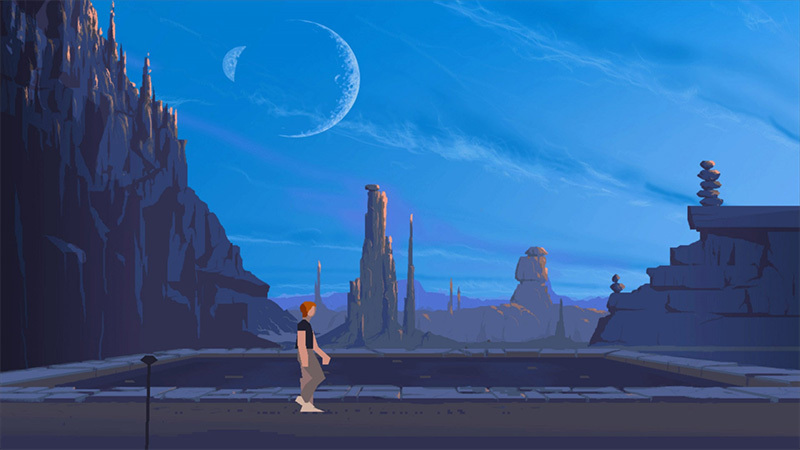 The design of Another World works in tandem with its incredible sense of atmosphere, as the player is given just as much information as Lester himself, and the game presents no real answers by the end. The unnamed dimension featured in Another World is one of conflict, sadness, and peril, as we see hints of a past civil war between the planet's several thousand natural death traps. Even as early as 1991, Chahi could've described this world with a verbosity that would make Wookiepedia blush. But he chose to let it speak for itself (in an alien language, no less), which gives Another World an enigmatic quality that's rarely seen outside of designers directly inspired by his game. It shouldn't surprise you that Team Ico's Fumito Ueda cites Another World as a major influence, and Ueda certainly takes after Chahi in terms of productivity. In the 23 years since its original release, Chahi has only released two games, one of them being fraught with production problems throughout its extended development cycle—sound familiar? Thanks to Chahi's efforts, Another World has been made playable on just about every device capable of sending a signal to your TV—and seeing as this is the three-year-old 20th Anniversary Edition, there aren't many surprises to the 3DS version I checked out. With a touch of a button, you can switch from old to newer graphic styles, and this version includes the option to add music from the original, CD, and remastered editions of the game. But the experience is still the same regardless, and Another World is definitely an experience every gamer should have—and not just for the sake of checking out a historical curiosity. Another World still feels incredibly forward-thinking, almost as if Chahi had developed a game for this decade's indie scene without even realizing it. If you somehow missed Another World over the past few decades, and a 3DS (or Wii U) is your only outlet for video gaming, you've officially run out of excuses. I can't help you scrounge up that $7.99, though. Tagged with 3DS Handhelds,	Another World,	Critique,	Eric Chahi,	eshop. Nadia re-examines Undertale a year after its release to determine if Toby Fox's RPG about monsters and men still deserves its accolades. A year on, Jeremy looks back at Nintendo's excellent level-design tool and asks, "Does it still seem excellent?" Sorry for the inside baseball, but I have to get this off my chest. Capcom's mix of eastern and western RPG sensibilities does a fine job of getting to the point—even if it could use more ambition.